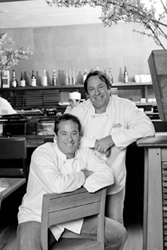 Bruce and Eric studied and graduated together from Le Cordon Bleu in 1990, ultimately establishing the first Blue Ribbon restaurant in Manhattan’s Soho neighborhood. Their restaurant is a reference to their time in Paris and in Le Cordon Bleu Paris school, and focuses on simplicity and delicious food. American brothers Bruce and Eric Bromberg attended Le Cordon Bleu Paris and graduated with highest honors. After graduation, Eric carried out apprenticeships at top restaurants in France, including Le Recamier in Paris before deciding to return to America. Bruce also carried out apprenticeships in France, notably at the two Michelin starred Duquesnoy. He learned the art of bread baking at Boulangerie Poilâne in Paris and haute cuisine at three Michelin starred Pierre Gagnaire restaurant in Saint-Etienne. In 1992, the brothers created the first Blue Ribbon restaurant in Manhattan’s Soho neighborhood. Blue Ribbon, or the English translation of Cordon Bleu, is a reference to Bruce and Eric Bromberg’s culinary experience in France.The Brombergs’ only rule is that everything served be simple and delicious. In the years that followed, the duo assembled a small Blue Ribbon empire in the United States.Their restaurants have received many awards from publications including Wine Spectator, Zagat and Time Out New York. They were also finalists of the prestigious "James Beard Award" for best restaurateur. In April 2010 Bruce and Eric Bromberg published their first cookbook, The Blue Ribbon Cookbook, Better Home Cooking.